Even if you’ve never had root canal treatment, you may dread the procedure just because of jokes or tall tales! The fact is, a root canal treatment is just that: it treats the problem and relieves pain. In most cases, you will not have any pain during a root canal procedure. At the dental office of Dr. Marc Worob in Austin, we do everything we can to make sure you’re relaxed, comfortable, and as pain-free as possible for all of our procedures, from filling a cavity, to periodontal therapy, to…root canals! 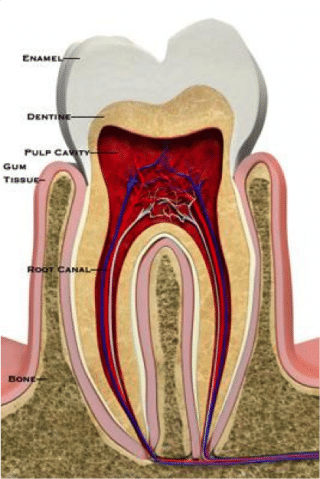 The pulp cavity and root canals of your tooth contain the blood vessels and nerves that your tooth needs to thrive. If these tissues become injured or diseased, infection can set in and will need root canal therapy. How does Dr. Worob perform root canal therapy? When we perform root canals, we remove all of the diseased tissue and treat the infection. The canals are thoroughly cleaned out to remove any bacteria or debris. We then fill the canals to replace the tissue and seal them against bacteria that could cause problems in the future. Once the root canals have been treated and filled, we’ll reinforce and help protect your tooth by placing a porcelain crown over it. This is the best solution to help preserve your natural tooth. Call our dental office in Austin at 512.346.5196 if you’re experiencing any discomfort. Root canal treatment is just one of the many dental services we provide. Please contact us if you are interested in cosmetic dentistry, or looking for outstanding general or restorative dental care. Many pet owners understand there are common foods we all enjoy that can be toxic to their pets. Chocolate, raisins, grapes and onions to top the list, but there are many others that are not as well known. 12 Oaks Dental not only cares about you, but your extended 4 legged family as well! A sweetner called Xylitol is becoming a more popular ingredient in many types of toothpaste, gums and candies. Xylitol can also be used as a sugar substitute (often labeled as sugar free) in baking too. Even the smallest amount of Xylitol can be extremely toxic to dogs. Liver failure, low blood sugar and death can come from Xylitol poisoning. A single piece of gum, if left untreated can result in hypoglycemia in dogs. Do not ignore vomiting and lethargy if you suspect your pet has ingested Xylitol. If treated quickly, proper medication and fluids can prevent long term damage or even death. 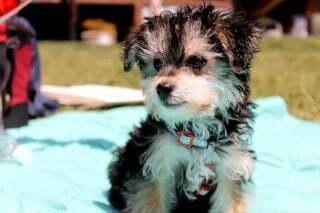 If you have a story or picture of your family pet share it with us on FaceBook! Summer officially starts in 32 days although after this weekend it feels like is is already here in Austin! Here are some fun movies to get you ready for the hundred degree days. Can you name the movies? Linda, one of our amazing hygienists, here at 12 Oaks Dental in Austin, loves to cook healthy meals and snacks. 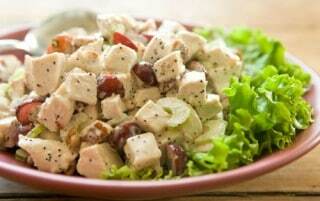 Here is one of her takes of Whole Food’s Sonoma Chicken Salad. 2-3 Boneless Half Chicken Breast ( organic or natural is the best) ; boiled and cooled in the refrigerator-Then cube. 2 tsp. Apple Cider Vinegar ( I use ‘Hengstenbreg’ Vinegar, seasoned with 13 fine herbs. There’s so much to think about and look out for when you bring a new baby home. Whether it’s your first, or you’re bringing home a little brother or sister, visits to the dentist and dental care are probably the last thing on your mind! But healthy teeth and gums are important to everyone’s overall well being. Here are a few tips to get your little ones started on a lifetime of good dental health and habits. Start taking care of his teeth before they ever appear! Gently wipe his gums twice a day with a soft, moist cloth or gauze. It will help keep any milk or food residue from creating bacteria in his mouth. That first darling tooth needs as much care as all his permanent teeth later on. Begin with a small, soft toothbrush and a tiny drop of non-fluoride toothpaste . Use a circular motion to very gently brush his teeth (or tooth!) and gums. We don’t have to tell you this! Limiting sweet drinks like juices will give your child a good start on healthy eating habits, and also help prevent decay. And of course, you don’t want to leave a bottle filled with juice or anything but water with your baby for any period of time. This also gives harmful bacteria a chance to start growing. 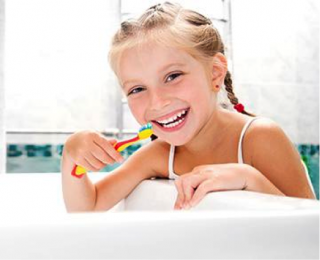 Make regular dental visits a natural part of your child’s health care by starting early. Your child should have his first dental visit by age 3. At 12 Oaks Dental, we treat our littlest patients with as much respect and care as we do every patient. We encourage them to participate and ask questions; we explain everything we’re going to do before we start. If you have a child who is ready for his first checkup, please call our dental office in Austin. And don’t forget your own dental care! Make an appointment for both you and your child! Is your spouse’s snoring keeping you awake? Do you have a hard time sleeping? Are there times you have to sleep with a pillow over your head to keep the loud snoring at bay? Is sleeping in another room the only solution? No. We can help you!!! We have begun screening patients for airway or breathing problems. These are problems that are usually noticed by their spouse or partner while the person is sleeping. For many years in Northwest Austin, 12 Oaks Dental has been treating patients who have a breathing problem while they sleep. We have been custom fitting them with an oral appliance to help them get more oxygen. Ideally, a person should have a blood oxygen saturation of 90-100% while sleeping. Unfortunately, people who snore are getting anywhere from 70-88% on the average. This is not only unhealthy, it is dangerous. In the last couple of years there have been new findings in the science of sleep medicine. There have been studies done to prove that an untreated airway problem can significantly contribute to acquiring hear disease and diabetes! Typically people just say, “Yeah, my Dad snores and so do I. It’s a guy thing right?” Actually, snoring is telling you something. It is an alarm telling you that there is a problem that needs attention. Even soft snoring or making some kind of noise is not healthy. Now that you know there is a concern with snoring, what can you do about it? Take this 5 question assessment. If you answer yes to 3 or more then you should get a sleep evaluation. How do you get started? Just call our office. We will set you up for a sleep evaluation with either Dr. Worob or Dr. Cronin to further evaluate what could be causing the problem. We will help you find the solution to your or your partner’s sleep problems so that there will be peaceful sleep for all.